This entry was posted on January 29, 2019 by B4S. Jabra have added to their portfolio of business communications products with the Jabra Speak 510 Plus - a truly mobile conferencing unit which will appeal to the requirements of the modern, agile worker. This USB and Bluetooth enabled portable speakerphone allows immediate and handy set up of business meetings. The 510 plus is plug and play and easy to use. The 510 Plus also incorporates LED indicators and intuitive user controls for convenience of use. We have seen popular portable speakerphones from Sennheiser, Yamaha and Plantronics of late but with Jabra's innovation and eye for design we are excited to present this. What makes this speakerphone so useful is that it really can play a part of Unified Communications. It is able to connect via USB to PC/ Mac whilst also having Bluetooth™ connectivity to allow a seamless experience in connecting to mobile devices such as smartphones or tablets. The Bluetooth™ is fully conversant with generic Unified Communications and Skype for Business protocols, allowing it to action system based commands. Of course, the raison d'être of any conferencing unit is to deliver sound. The Jabra Speak 510+ carries an inbuilt Omnidirectional Microphone which gives a full 360%deg; coverage. DSP ( Digital Signal Processing ) complements the HD Wideband audio giving this compact and portable conference phone a great area of coverage with extremely clear sound distribution and transmission. "When the Link 370 is connected to your Jabra headset or speakerphone, the HD Voice lets you experience high-definition, crystal-clear sound and enjoy life-like UC conversations. In addition, HiFi Audio Streaming with A2DP allows you to stream music in amazing HiFi quality." This also enables non Bluetooth™ enabled devices to use the conferencing facility provide by the 510+. 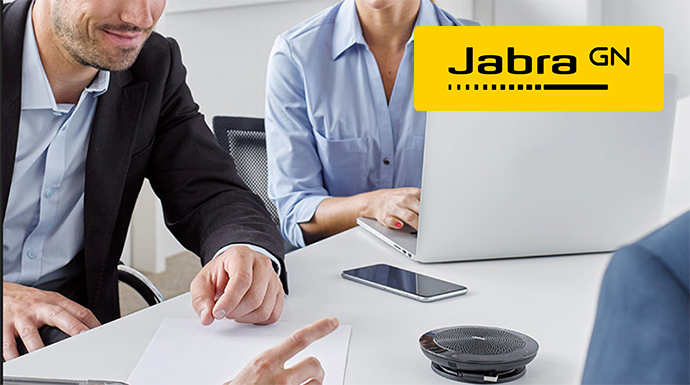 The Jabra Speak 510+ is available online in two variants : one a generic UC version and one SFB Certified ( view the Jabra Speak 510+ here ) Call us on 0844 824 6664 or contact us via the form here for more information.